With powerful processing and long-hour battery life, the ThinkPad T470 is designed to enhance your productivity, anywhere. Easy-to-use, -deploy, and -service, this 14” robust laptop has a host of advanced technology, including improved storage and secure fingerprint reading. All of this, plus the legendary ThinkPad reliability. 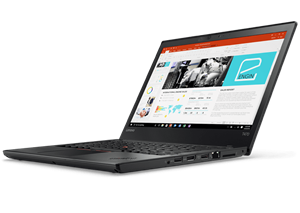 With the responsiveness and efficiency of excellent processor, the Lenovo ThinkPad T470 lets you switch effortlessly between your favorite apps — increasing your productivity, creativity, or entertainment levels along the way. The improved hard drive has no moving parts and performs faster — including booting up, opening and transferring files. As well as being quieter, it’s also more reliable, more rugged, and more secure. You can rest easy, knowing, that your T470 is more than capable of surviving the bumps and bruises of everyday life. Now, you can say goodbye to unwanted distractions. And hello to a faster laptop, from startup to shut down and everything in-between. With advanced fingerprint technology, there’s no need to worry about remembering your password. Simply touch the fingerprint reader to log in, quickly and securely. With its two batteries and Power Bridge technology, the T470 gives you greater flexibility and long hours of power on a single charge. That's more than enough juice to help you burn the midnight oil or binge-watch your favorite show. Weighing little and thin, the T470 gives you portability, without sacrificing performance. Its 14" display delivers sharp, vibrant visuals — perfect for working on the go or kicking back to enjoy a movie. With super-fast LTE-A (4G) connectivity, the T470 gives you prompt access to all your cloud data and apps — even if you are out of Wi-Fi range. The T470 has an HD web camera and dual-array microphones (with background noise reduction) as standard — ideal for whether you're on a call in a busy open-plan office or a bustling coffee shop. By constantly listening to the customers, Lenovo has been able to refine the T470’s TrackPad and TrackPoint. With an improved design, that lessens jumps or gaps when scrolling, these pointing devices offer a smoother, cleaner, and more accurate experience. Together with the ergonomic ThinkPad keyboard, the T470 will soon help you make light work of hard work.